challenge most people cannot allow themselves to meet. In France, during the years 1400 to 1700, England and France were both in a time of development and transition from the renaissance to the reformation (Nosotro, 2000). Because of this, many cultural norms and traditional practices were at risk of being changed or forgotten all together. During 1412 in Domrémy, France, a girl named Jeanne d’Arc was born to a family of low social status. This was a very interesting time to have been living in France, because the 100 years war was still taking place, and was on the verge of its 76thyear of existence. make is easier to understand the type of life a peasant, such as Joan of Arc would have been born into. This life would have been socially chaotic, financially unstable even more so than usual, and morally questionable. any more than attend church and spread her beliefs until she was around the age of sixteen. So... where did these visions lead? asked who her “lord” was, she said “God”,and this time, he promised to arrange for her to be escorted to the Royal Court at Chinon. On the journey, which lasted a total of eleven days, she opted to wear man’s clothing, since it was through the enemy territory (Beck, 2010). examined. Finally, after three days of examination it was determined that “nothing has been found in her, only good, humility, chastity, piety, propriety, [and] simplicity” (Williamson, 2010). Once she was approved, Charles allowed her to go with an army to Orleans. 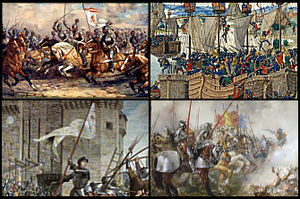 Once they arrived, Joan led the French to their victory at Orleans, and within a year, to several other victories, including Patay and Troyes. Pettinger (ND) writes that “Many other towns were also liberated from English control, and it allowed a triumphal entry into Dauphin for the coronation of King Charles VII on [July 17, 1429]”. In essence, she was able to completely reverse the standing of France within the year that she was on the warfront, although she never actually fought and served as more of an inspirational mascot (Cohen, 2012). eventually resulted in her execution. Though Joan of Arc was executed, her spirit didn’t die with her physical body. It is said that over 10,000 people attended her execution, which may have actually added to French national pride. She became a martyr, and motivation to the French to continue fighting for the country that Joan helped them to appreciate. 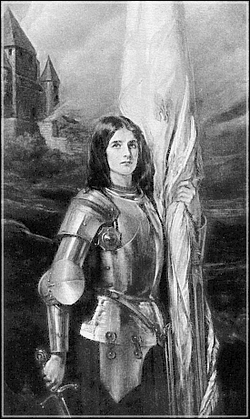 A long 26 years after her death, the French finally drove the English out from Rouen, and “in a later inquest she was declared to be officially innocent and was officially designated to be a martyr.” (Pettinger, ND) Joan of Arc was later declared a saint, and to this day, she is regarded as one of the most important militant leaders in France. To have lived such a short life (dying at age 19), she was beyond doubt a strong person. She was able to meet the challenge to live based on who she was, and to remain true to what she believed in. Jehanette d’Arc was truly a person of her word. She stayed true to what she believed in, and who she believed she was. This makes her a remarkable woman, and a woman who truly “changed the world”.